Prasar Bharati Has Released Recruitment Notification For 14 Production Executive, Jr. Videographer Posts. All Eligible & Interested Candidates Can Apply Offline. Further Detailed Information Regarding Educational Qualifications, Age Limit, Selection Procedure, Exam Pattern, Syllabus for Prasar Bharati Recruitment 2017 - 14 Production Executive, Jr. Videographer Post is mentioned below. Selection Process - All Eligible Candidates will Be Selected Based on Their Performance In Written Exam, Skill Test/Inter-view . Pay Scale - Rs. 30,000/- (Post 1), Rs. 33,000/- (Post 2), Rs. 20,000/- (Post 3-5), Rs. 25,000/- (Post 6), Rs. 40,000/- (Post 7) . How To Apply - All Eligible & Interested candidates Can Download application Form through official web-site (http://www.ddindia.gov.in). After Filling The application form, candidate must send by hard copies of application a long with relevant testimonials (Mentioned In Detailed Advertisement) to the following Address before / (2nd June 2017). Address -Additional Director General (Training), National Academy of Broadcasting and Multimedia, Radio Colony, Kingsway Camp, Delhi- 110009 . Last Date to Submit Filled-In Application : 02-06-2017. Click Here For Prasar Bharati Recruitment 2017 Detailed Advertisement & Application Form. 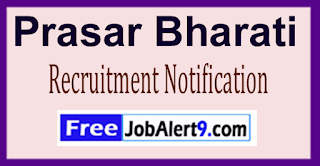 Prasar Bharati Has Released Recruitment Notification For 03 Content Managers Posts. All Eligible & Interested Candidates Can Apply Offline. Further Detailed Information Regarding Educational Qualifications, Age Limit, Selection Procedure, Exam Pattern, Syllabus for Prasar Bharati Recruitment 2017 - 03 Content Managers Post is mentioned below. Pay Scale - Rs. 25,000/- . How To Apply - All Eligible & Interested candidates must send by hard copies of application a long with relevant testimonials (Mentioned In Detailed Advertisement) to the following Address before / (31st May 2017). Address -The Director, External Services Division, All India Radio, Parliament Street, New Delhi-110001 . Application Has To Be Sent Latest By - 31-05-2017. Click Here For Prasar Bharati Recruitment 2017 Detailed Advertisement.